When I semi-bake, I take a boxed mix and add in my own little tweaks. In this recipe, I am using fresh apples and pumpkin pie spice. What, you’ve never heard of pumpkin pie spice? It’s easy to find in the spice section of your local food market. I love this spice because it saves me money as it’s a combination of cinnamon, sugar, cloves and nutmeg; everything I need is available in one jar. Pick it up on your next market run and give it a try. Comment below how you plan on using this spice. Preheat your oven according to directions on the muffin mix box. It’ll probably be 375 (double check). Prepare muffin mix as directed. Most recipes will call for 1 egg and 1/4 cup of vegetable oil. It really depends on what brand you choose. Go ahead and follow the directions on the box, lightly combining your mix, oil and egg. Add in two tablespoons of pumpkin pie spice and 3/4 of the apples. Mix until your apples are evenly coated with the batter. Line your muffin trays with cupcake liners. Using a melon ball scooper, add 1 scoop of the batter into each liner. 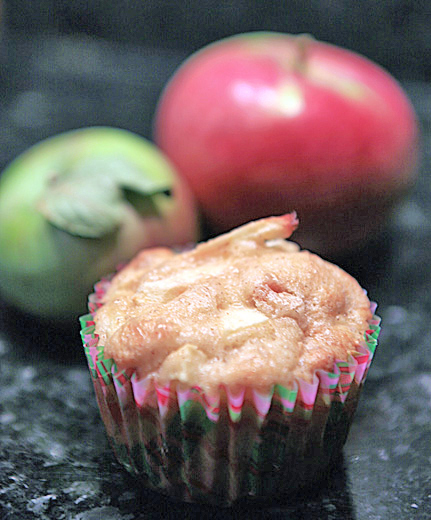 On top of each muffin, add 3-4 cubes of your leftover apple (this makes for a nice presentation) and sprinkle raw sugar on top of the apples. Bake according to the directions on the box, which should be about 12-14 minutes. Allow muffins to cool and enjoy.